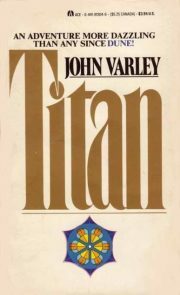 1979’s Titan is the first novel in John Varley’s Gaea trilogy. Ringmaster is the first crewed spacecraft to visit distant Saturn. The crew discovers a twelfth moon of Saturn, the first discovered in the six decades since Janus and Epimethius were detected in the 1960s1. What at first appears to be a small object turns out to be huge, over 1300 kilometres in diameter2. By rights, any moon that large should be spherical and comparable in mass to our Moon. This object, which the astronauts initially call Themis, is a torus of low mass which is spinning rapidly enough that any object on its surface would be flicked off into space. The obvious conclusion is that the object is artificial, possibly an alien generation ship. When Ringmaster approaches the object, they discover something else about Themis. It knows that Ringmaster is nearby and is able to reach out and tear the spacecraft apart. The crew — Cirocco Jones, Bill NLN, April and August Polo, Gaby Plauget, Calvin Greene, and Gene Springfield — are grabbed by immense tentacles and borne off into the depths of the vast moon. 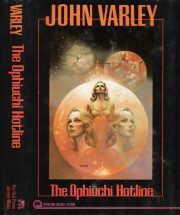 1977’s The Ophiuchi Hotline was John Varley’s first novel. Convicted of crimes against humanity, Lilo’s fate is set. She will be executed as thoroughly as the state can arrange: her genetic samples will be destroyed, her brain records erased, and her body will be dropped into one of the small black holes 1 that power the Eight Worlds. All this will come to pass, but it won’t be the end of Lilo’s story. 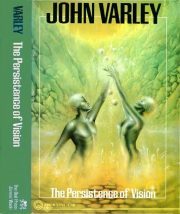 The tragedy of John Varley’s 1978 collection, The Persistence of Vision, isn’t that its contents have aged; although time has not been kind to some of them, others have fared well. The tragedy is the stark contrast between the John Varley of the 1970s and the John Varley of today. Young Varley was one of the few male authors of note to emerge in the disco era, the author of a remarkable series of short works . The mature Varley wastes his talent on second-rate Heinlein pastiches  and novels whose moral is that, as bad as the collapse of civilization would be, at least it would turn women back into homemakers and get the kids off the Twitter.